The pieces are personal in size, the dimensions of human objects. Untitled (Safe II) stands just shy of two feet tall and could be a bedside object, and the browned panels of Our Work measure about five inches on each side, curling up like warped old family photographs. They do not announce themselves as Artworks, monuments to the artist’s Genius to be installed in the foyer of a museum or on the wall of a corporate office, but rather invite the viewer in with restraint, rewarding subtlety and attentiveness. While the formal qualities of these artworks render them intimate—the found materials, the personal size, the handwritten lines—in their conceptual conclusion Bastian provides the distance of ambiguity. Untitled (Safe II) and Our Work are tantalizing, teasing even, as they simultaneously present and withhold. 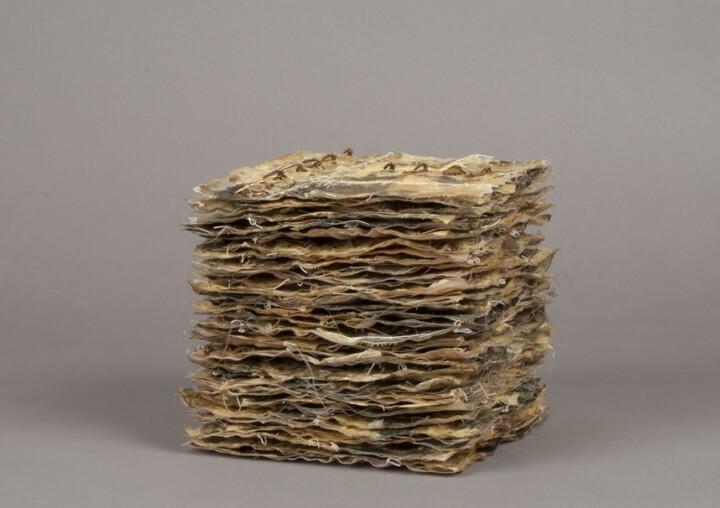 Looking into Untitled (Safe II) evokes the experience of approaching a tunnel, when what is nearest is prominently clear, and what is immediately beyond is obscured in darkness; a peek under the visible book reveals that it sits on top of a pile of similar volumes bound together in stacks by wire, delicate and inaccessible. The typed text inside (we assume each volume but can only verify the first), which forms a compilation of letters or journal entries, is repeatedly sewn through with a tightly controlled running stitch. So much of what I’ve written about Bastian’s work could imply that it is exasperating, but the artist’s intention is to frustrate, not to make us frustrated. She acknowledges the presenting-yet-withholding nature of the work: “just as walking into an old house or coming upon an old object gives us the sense of knowing or familiarity while simultaneously remaining a mystery, so does my work reveal and veil itself at the same time.”6 But this revealing and veiling is meant to open up one’s experience of the art, not to impede it. 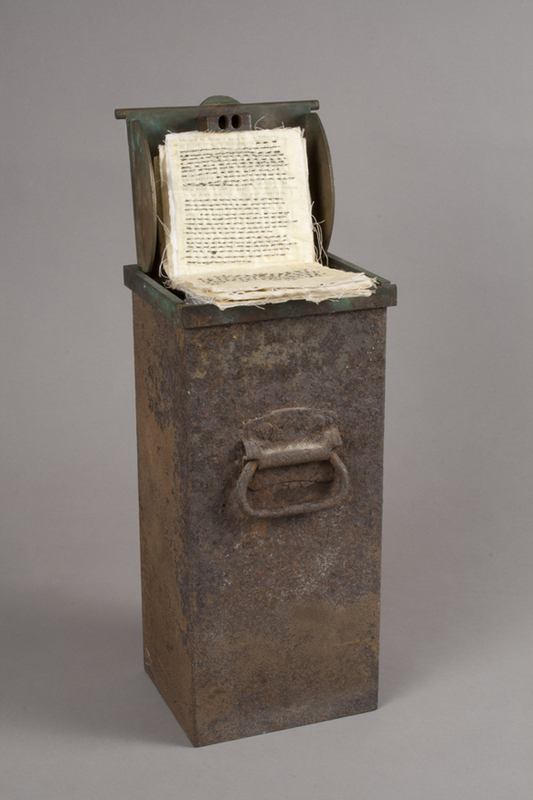 When asked whether the dual nature in her works is intended to obstruct or simply appears that way as a byproduct of the human imperative to understand, the artist responds that such a situation is “the definition of what memory is—a sometimes blurry piecing together of what we believe has occurred.”7 And it is perhaps this reference to memory that encapsulates the works’ positioning vis-à-vis the binary dialectics of public/private and intimate/strange. Memory dwells in the same stratum as dreams. It is personal, providing a varied, emotion-laden, and unique construction of a series of events or experiences, but also somewhat unknowable, being vulnerable to influence, time’s murkiness, and self-corrective rationalization. The conglomerate character of memory renders it both individual and corporate, a thing-created while a thing-being-created. In these works Bastian has captured the uncanny sensation of déjà vu, that mysterious recognition, and the compelling expression of her objects ultimately emerges from the realization that their past—familiar yet strange—could be ours. 1. Kry Bastian, e-mail message to author, 12 July 2011. 5. Kry Bastian, “Statement,” accessed 17 July 2011, http://www.krybastian.com/statement.aspx. 6. Kry Bastian, e-mail message to author, 12 July 2011. Kry Bastian (b. 1972, Carmel, NY) earned her BFA in Sculpture (1994) and her MPS in Creative Arts Therapy (2002) at the Pratt Institute, Brooklyn. At Pratt, she was the recipient of many academic awards and scholarships, including two Circle Awards for Outstanding Academic Achievement (1994, 2002). Recent solo exhibitions have been held at Phantom Gallery, Baton Rouge, Louisiana (2003), and Jungle Science, Binghamton, New York (2009). Bastian’s work has been included in numerous group shows, most recently at Pierogi, Brooklyn (2008); State Street, Binghamton, New York (2010); City Hall Gallery, Binghamton, New York (2010); the State University of New York at Cortland Memorial Library, New York (2010); and Crest Arts, Brooklyn (2008, 2009, 2010, 2011). Bastian lives and works in Binghamton, New York. More information about her work can be found at www.krybastian.com. 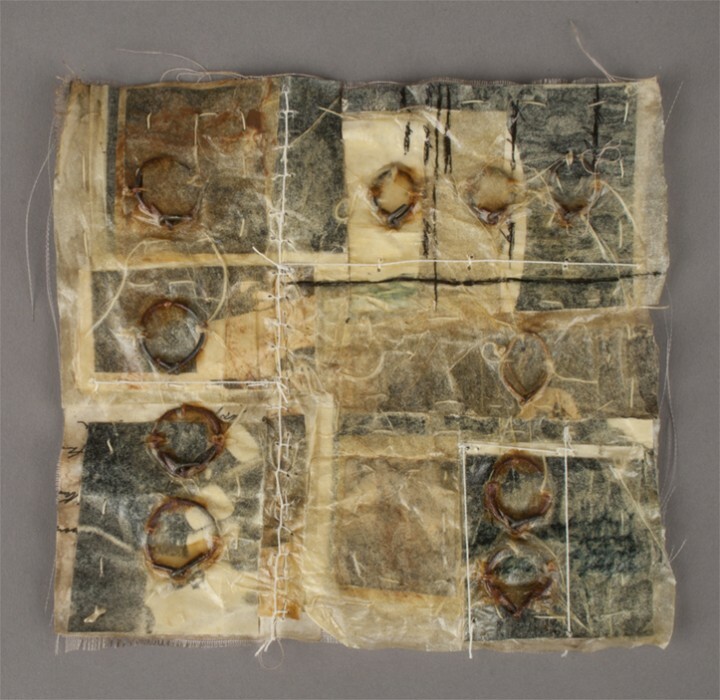 Kristen Gaylord earned her MA from and is a PhD candidate at the Institute of Fine Arts, New York University. She is interested in modern and contemporary art with an emphasis on postwar America, and also specializes in Latin American modernism and the history of photography. She lives and works in New York City. Kry Bastian, e-mail message to author, 12 July 2011. Kry Bastian, “Statement,” accessed 17 July 2011.